One of the most interesting sessions I participated in during the preview sailing on Allure of the Seas was a tour of the bridge—command central for the huge ship. Captain Hernan Zini oversees all activity from this area. Wide windows look out over the passing ocean for a bird’s eye view of the surroundings. 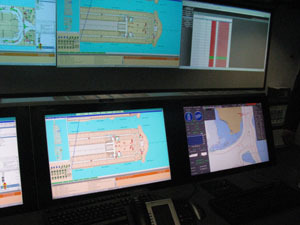 But the real task of piloting the newest Royal Caribbean ship falls on technology—computers and radar constantly update the crew with information about the weather, ship’s position, speed, direction, currents, and much more. 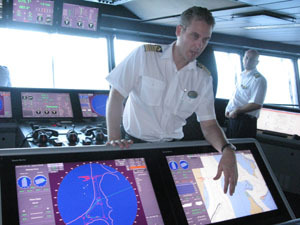 In fact, Captain Zini said they can take the ship from port to port relying entirely on data provided by computers. Sensors calculate the ship’s position in the water; only seven feet are below water level, while the floating resort soars 213 feet above the surface. The ship cruises at a speed of 22 knots, but the really neat thing is it can also travel sideways at four knots. Imagine having a car that could drive sideways. Four bow thrusters with 7,500 horse power each move the 225,000 tons of wood and metal smoothly through the water. Despite some windy weather causing waves to kick up, I never felt movement on the ship. That’s a good thing, too, for the entertainers, especially dancers and high divers, who could miss their mark if the ship rocks even slightly. 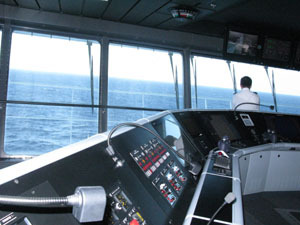 Crew members work in eight-hour shifts, with four hours usually spent on the bridge observing the ocean and four hours monitoring safety devices. Safety is taken very seriously, stressed Mathias Sebom of Sweden, Superindendent of Safety. 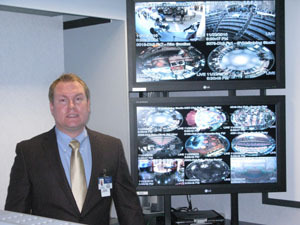 Crew spend much time monitoring public areas of the ship through 1200 cameras stashed inconspicuously. That allows them to watch movement of passengers and know if anyone is in distress. The fire alarm system alerts staff if there is smoke anywhere, so security personnel can immediately check out the cause. Separate fire zones are delineated, and if there is a problem, it can be contained to one section of the ship. Drills are held weekly, and extensive training is ongoing to meet any challenges that might happen at sea.